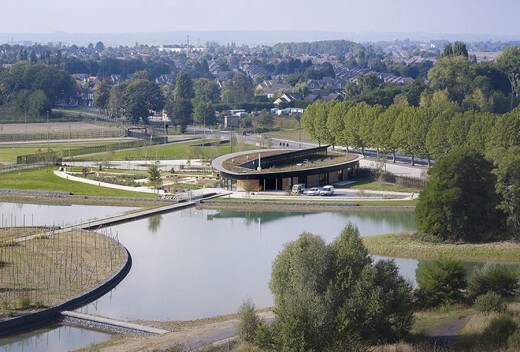 After a call for ideas addressed to the local residents, the Maison de l’Environnement et du Développement Durable (Centre for the Environment & Sustainable Development) of the Hénin-Carvin Joint Urban Authority adopted the name Aquaterra. The facility is in the middle of a large park on the site of the former Drocourt coking plant. Founded in 1925, this was one of Europe’s largest coke production plants. After changes in the coal and steel industries in the late 20th century, the plant finally closed in 2002. 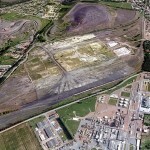 All of the developments were quickly demolished, leaving just a large platform and some terrils (slag heaps). The marked, polluted ground and the slag heaps, mountains and hills, composed of inert but emblematic masses in this flat landscape, are the only relief visible from a long distance. Today, architects and landscape designers have a duty to preserve and restore local collective memory and heritage, but without having any physical links with the former industrial activities. To avoid becoming a museum, this area must find itself a new purpose. Ecology is used as a means to reconcile the local people and this place, which have fallen out of love with each other. 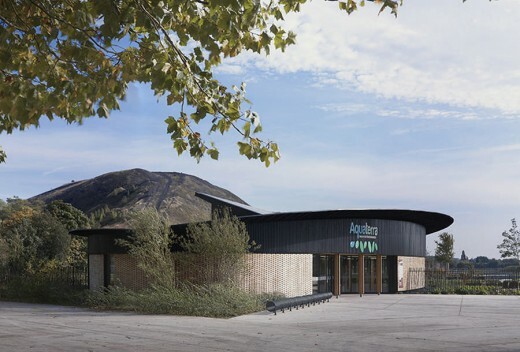 The aim of this resource building is to make visitors aware of environmental questions. The architects have designed it as a demonstrational scheme and a life-size experiment. With Minergie® certification, behind its original skin of wood bricks and its lens form, it contains all the energy systems that ensure good practices and thermal comfort. 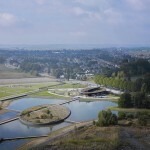 Aquaterra is part of a much larger park project: the Parc des Iles (Islands Park) designed by the Ilex landscape design firm. 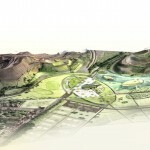 On the 45 hectare site, the scheme propose a play of islands and artificial lakes, linked together by the major routes that structure the area. Creating playful, esoteric nature, off-beat in relation to the imagination and normal practices, the park reverses the image of a site that is very badly marked. 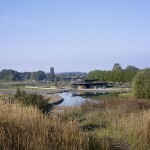 Aquaterra symbolises the second phase of the metamorphosis called L’Orée du Parc, which includes the building and its accompanying landscape. It is strategically located, and the building occupies a pivotal position in the time and space of the development. Its lens form is in harmony with the overall design. North-west of the Parc des Iles, the building is central to various urban planning, roads and landscaping projects currently in progress. Urbanité, Europan’s scheme, is adjacent to neighbourhoods made up of clusters of small houses that are typical of mining areas. Connexions, a scheme which consists in upgrading of the north-south access road, is the indispensable link. 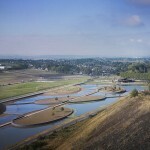 Lastly, the Orée du Parc landscaping scheme adds to planting of the slag heaps. 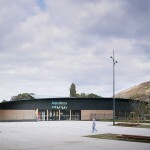 The building is the anchor point for the relationship between people and nature, between the industrial history and the future, and between the town and the landscape. Aquaterra is a resource for educating and raising the awareness of the local people, particularly schoolchildren, concerning all environmental questions and encouraging the popularization and widespread application of good practices, such as waste sorting, sustainable housing, and waste embodied energy. A very large part is devoted to climate disturbance, which is spectacularly illustrated by the blooming of exotic plants and seeds accelerated by the warm ground of the slag heaps. The contrast between black soil and exotic plants creates an extraordinary visual scene as well as providing natural pollution control. 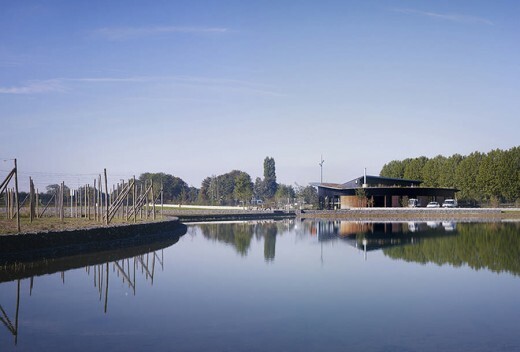 Faithful to one of the Tectoniques firm’s convictions – according to which architecture must follow the landscape as much as the landscape accompanies the building – the scheme takes inspiration from the vocabulary of the islands and the artificial lakes. With its lens-shaped design on a landscaped plateau, it fits naturally into the geometry of the site, of which it forms an island in its own right. The oval form is universal, organic and generous. It opens outwards on all its sides and offers great openness and transparency between the inside and the outside. For all the spaces open onto a panoramic, circular façade. On the inside, this simple figure allows very clearly readable, compact and economic spatial organisation. 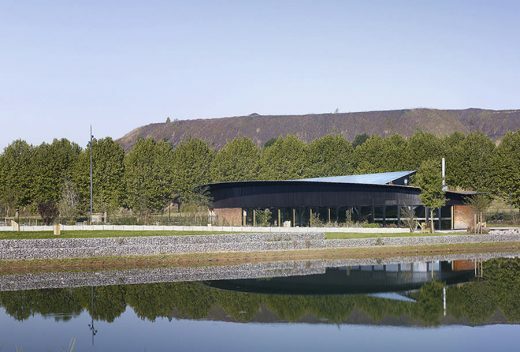 It is accentuated by a butterfly wing roof profile whose dark colour recalls the slag heaps. This “look-out” building is a solitary object that will most probably not be accompanied or surrounded by urban development. Therefore it must act alone, on the scale of the large surrounding area. The choice of the oval form allows a continuous façade to be displayed, without any hierarchy of the orientations. One same architectural image is seen from all viewpoints. Conversely, the views of the site from the building complement each other, both near and far, in all directions. This capacity for focussing and concentrating the area towards a single point is the prime objective of the scheme and its architectural form. On the south, the spaces for public reception; on the north, the facility’s “back office” and the park’s maintenance service rooms. 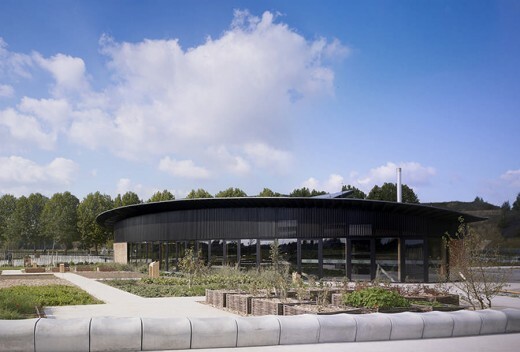 On the south, permanent and temporary exhibition spaces are connected to a greenhouse that contains a certain number of environmental features: a planted wall, rainwater recovery tanks, a wood pellet boiler, and a photovoltaic power unit with an educational interface. From a construction viewpoint, the building remains faithful to Tectoniques’ usual precepts. 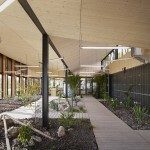 It is built entirely with dry construction, in a mixed combination of wood and metal. It takes inspiration from existing elements on the site: large portal frames laid out along long lines that formed the structure of the industrial landscape. Inspired by this arrangement, the project is built from three lines of metal portal frames consisting of standard industrial profiled sections. The secondary structure consists of timber boxed constructions, filled and insulated with straw bales, for the external walls and the roof. 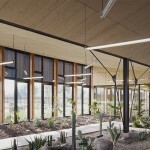 The aim of using bio-sourced materials logically led to giving priority to the use of wood (for the structure, the internal finishes and the facings of external walls), combined with insulation material of plant origin produced by a short production and distribution channel. The oval form was obtained without curved elements, which are too costly, but with a succession of small flat elements on small construction grids, which created the facets of this ellipse. The facing of the external walls is in an unusual material that refers to the local collective memory: the wood brick. Wood is used as a solid component; it is stabilised, net-linking Douglas Fir. The bricks are fixed on a framework of metal rods. So the wall is seen in two ways: from far away it looks like a wall of bricks, and from close up, it is a light, changing skin, like a curtain. 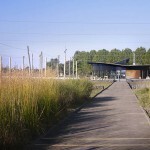 The building that houses the environmental centre must be exemplary from the viewpoint of its ecological footprint. Firstly, an architectural style must be chosen that complies with a constructive ethic, and the scheme must be based on bioclimatic design. Also, renewable forms of energy must be used: the sun and wind are preferred for producing energy. The building is compact and well insulated. It benefits from a good south-facing aspect, while being protected by an overhanging louvered sun-shield whose variable overhangs provide solar protection and shelter for the external walls. Daylight is distributed through the building’s entire width by the shed roofs, which are also used for ventilation and for air changes. The roof, which is considered to be an educational fifth facade, is planted with extensive (climbing and upward-growing) plants, and it also supports photovoltaic panels. Rainwater is recovered in tanks that are used for watering greenhouses and for flushing toilets. Humidity and thermal conditions are regulated in all spaces, and the quality of the internal air is controlled by a double-flow ventilation unit. A wood pellet boiler provides thermal comfort in winter. Two wind generators add to the photovoltaic systems for energy production. The site is particularly windy, and is a reputed spot for flying kites.